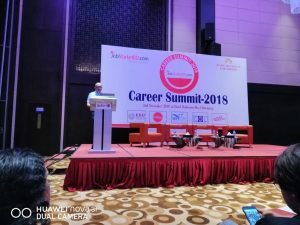 This year, Seaport Ship Services Limited, and Chittagong Online Limited has sponsored the Carer Summit 2018. This event was organized by JobMarketBD.com in association with Asian University for Women. On 2nd November, 2018. The program started at 2 pm and lasted till 7 pm at Hotel Radisson Blu, Chittagong. 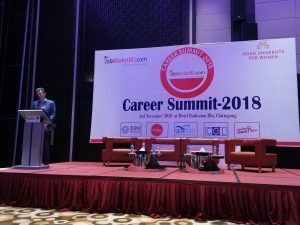 With the theme “Meet the Employers and Networking” the objective of the “Career Summit 2018” was to address the career development issues, and engaging the graduates and post graduates with the Employers from renowned organizations of Bangladesh. In this gathering, students from Asian University for Women, Chittagong University, East Delta University and Chittagong Independent University were presented in order to seek guidance and establish their network with different institutions. 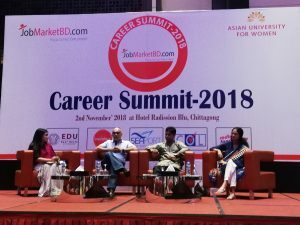 Starting of the session, Syed Tanvir Hossain Chief Human Resources Officer (CHRO), Grameenphone Limited) discussed the transformation of industrialization and technology and significance of advanced skills to cope with the rapidly changing job market and sustainable career development. It was an interactive session where the students could convey their concerns and pursue suggestions for self-development from Syed Tanvir Hossain. Followed by the “Industry 4.0 and Capacity Building for Competitive Advantage” session, there took place a panel discussion regarding “Expected attributes of Future Leaders: Employers Perspective.” This panel was participated by Eng. Iftekhar Hosen (Managing Director, CPDL), Ms. Sabeen Aameir (Director, BSRM Group) and Syed Tanvir Husain Chief Human Resources Officer (CHRO), Grameenphone Limited. In this session, the participants illustrated the importance of leadership quality and expected attributes from an employee. In order to fulfill the job responsibilities and ensure a smooth career pathway, a person needs to incorporate leadership quality, management skills and willingness to develop himself/herself. Through interactive activities, the latter sessions covered the topics regarding career planning, how to deal with interview sessions, and attributes of professionalism. At the end of the program, the event was completed with cultural program and presenting crest to the sponsors and speakers. 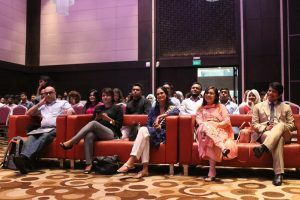 The summit was graced by participants from approximately 15 institutions including Grameenphone, BSRM, CPDL, Marks & Spencer, GlaxoSmithKline, SQ Group, US-Bangla Airlines, Midas Safety, Pathao, East Delta University and International Islamic University Malaysia. It was a successful event where around 200 students attended to meet the top organizations of Bangladesh as well as gathered knowledge and shared experiences with the employers. Both the organizers and students were very pleased with the session and showed their gratitude to the organizers. 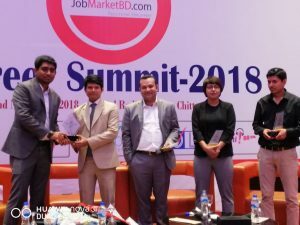 “This is the 5th Career Summit organized by JobMarketBD.com and they are planning to organize more events with wider reach”, said Abu Huraira Bhuttu, Managing Director, JobMarketBD.com.